The urinary tract includes the kidneys, ureters, bladder and urethra. Within each kidney, urine flows from the outer cortex to the inner medulla. 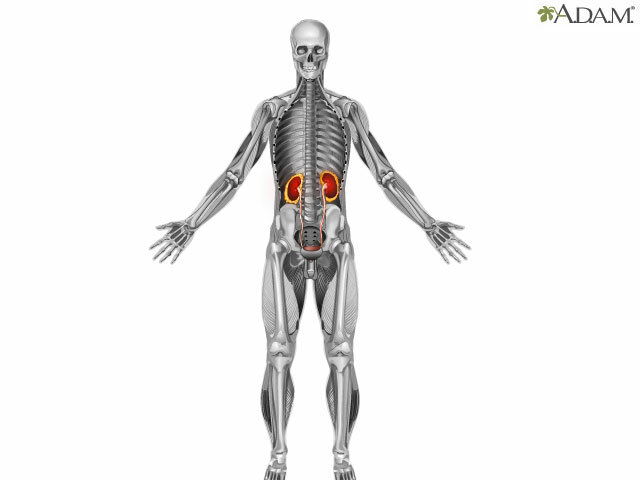 The renal pelvis is the funnel through which urine exits the kidney and enters the ureter. As urine can become very concentrated as it passes through the kidneys. When the urine becomes too concentrated, calcium, uric acid salts and other chemicals dissolved in the urine can crystallize, forming a kidney stone (renal calculus). Usually the calculus is the size of a small pebble. But ureters are very sensitive to being stretched, and when stones form and distend it, the stretching can be very painful. Often, people may not know they have kidney stones until they feel the painful symptoms resulting from a stone being stuck anywhere along the urinary tract. Fortunately, small stones typically pass out of the kidneys and through the ureters on their own without causing any problems. However, stones can become more problematic when they block the flow of urine. A staghorn kidney stone may obstruct the entire kidney. Fortunately, these stones are the exception rather than the rule.